« Cool Stuff Friday	» Unbound is Out Today!!! First: Congratulation on the good year 2014. I sincerely hope that 2015 will exceed even that. Second: Thank you for sharing this. It is not something that we should take for granted. Third: I would be very interested to find out how much of “Novels (U.S.)” actually comes from foreign readers. I am pretty sure that all my purchases (except “Rise of the Spider Goddess”) ended up in that sum. But without Amazon cooperating (and they don’t; tried it) there is no chance to find out. I’m not aware of any way to get that information, but it would be fascinating to find out. To call their answer just “discouraging” would require more optimism than I have. I appreciate you sharing this information, Jim. I wish you a successful 2015, as well. As a hoping-to-be-published-someday writer, I appreciate this. It shows the financial reality of being an author in real life, not just some abstract concepts. A firm insight into the publishing world and fiscal understanding. Hope you might do a post at Magical Words. The more of this type of information gets out there, the greater the chance of dispelling the — good & bad — earnings myths about being a writer. I always appreciate seeing your annual report, Jim, and I often mention it to folks who wonder what the writing business might be like. Thanks for sharing! John – I have several $2.99 e-chapbooks I self-published, along with Rise of the Spider Goddess, which is a quirky little novel. 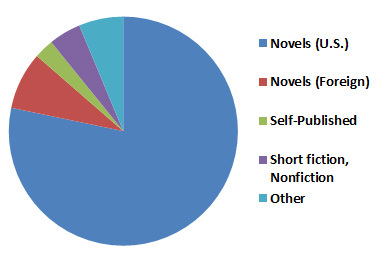 That’s compared to nine (ten as of tomorrow) commercially published novels. So part of what you’re seeing is because the bulk of my work is on the commercial side. I’d like to experiment a bit more with self-pubbing, and I’ll definitely be re-releasing my backlist as books go out of print, but this is where I’m at right now. I’ve done a few Magical Words guest posts, but do you mean specifically about writing income/finances? Thanks, Jim, these blog posts are always appreciated. Have you done a post on how you prioritize and compartmentalize your writing time, with regards to your job and your family time? I know you do a lot of writing on your lunch break. How else does that 20 hours per week break down? What do your writing goals per session look like? As someone who struggles with this, I’d love to hear your insight. Yup. Understanding the financial issues is difficult as most are reluctant (understandably) to disclose hard numbers. Again, I thank you for your candor. Jim, thanks for sharing! This is really helpful detail as it helps set realistic expectations for “new” authors. Glad to see your continued success, and here’s wishing you a great year in 2015! These are always so interesting; thanks for sharing. Some year it would be interesting to line up your pie charts to see how things change throughout your career, especially as you turn your backlist to self-pub. First, thanks for doing this. As a trying-to-get-started writer (one small-press book out) it’s incredibly helpful to see this sort of information about the realities of writing. Second, when you say you invest “about 20 hours a week” in writing, is that strictly writing/revision, or does that include time spent on promotion, speaking, readings, cons and con preparation, and so on? Thanks very much for continuing this series, Jim. I’m happy to see you had such a good year. Thank you so much for the insight! It’s hard to find figures for author income when only the quarter-million advances are talked about, or only extremely well-known authors are discussed. We aren’t all Stephen Kings. If I can manage to make even 1/5 of your income from 2014, I’d be a happy writer. I was wondering if you get higher royalties from ebooks, or from physical books? Sometimes there isn’t a whole lot of difference in the cost and if authors get higher royalties from one form over the other, then there is the impetus to purchase that format. My goals vary, but I get twitchy if I’m not hitting 1000 words a day. And it’s an ongoing struggle trying to balance writing and day-job and family time and all of the chores that need to get done at home. Ebooks pay a higher royalty percentage rate. On the other hand, a lower royalty rate on a hardcover with a higher cover price can end up matching the ebook royalties, where it’s a higher percentage of a lower cover price. As for purchase impetus, my only concern is that readers buy whatever format works best for them. Midnight Eastern is 9PM Pacific, so along about 8:59 I’ll be hitting sync on my Nook repeatedly. Bedtime reading!! Thanks for sharing your numbers, Jim! Congrats on a good year. Thought I’d help get 2015 off to a good start by ordering Unbound from my local indie bookseller – she says it should be in Wed. or Thursday – can’t wait! More Smudge! Wheee! Thanks for the info, Jim. I appreciate it. It’s inspirational. RE: the comment above from Edmond about a “Pratchett Point”; it means that point in which your writing income is sufficient to quit your day job. It refers, of course, to the point in which Terry Pratchett felt comfortable to take that step. Ah – got it, thank you. Financially, I think I’m there. It’s more a matter of benefits at this point, particularly health insurance. Congratulations on a fruitful 2014 and thanks for posting all this, it’s really helpful for aspiring writers. I’m impressed/slightly envious of how well you juggle everything. I work 20+ hours extra just during tax season, and by the end I’ve turned into Gollum (“Deductions, my precious!”) and driven off all my loved ones. Out of curiosity, what is your day job? State employee here in Michigan. I was interested than in a response to another comment, you mentioned a goal of 1000 words/day. (I assume that’s weekdays, or, not seven days a week.) My 2015 goal is 1000 words a day, four days a week. That may shift, as I’ll also need to do editing, researching publishers, and submitting, but I’m hoping those will be “in addition to” rather than “instead of”. I want to get into the habit of writing consistently. Congrats to you on a very successful year, and best wishes for a successful 2015 for everyone! Thanks, Sherry! It’s definitely a long-term career, with ups and downs along the way. Has the Affordable Care Act made any significant changes in that regard, or are you still at roughly the same tradeoffs as before? It opens up some options that didn’t exist before. Though I’m also nervous about what’s going to happen to the ACA over the next two years, and whether the parts of the act that give me those options will be whittled away. Let’s just say it’s something I’ve talked about with my wife, and I’m feeling a bit more hopeful about the long term plans.